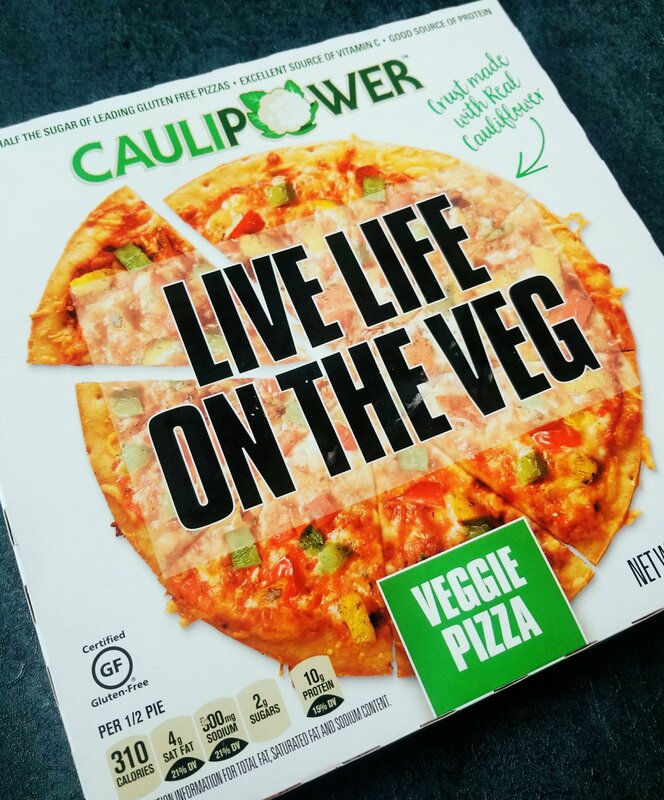 I have been wanting to try out this cauliflower crust pizza for quite a while now from Caulipower. Maybe you have been curious about it as well if you are looking for a gluten-free or low-carb pizza? I located a $1 off coupon online so I decided to put this on my Kroger ClickList order and give it a whirl! I had some pepperoni, black olives, onions, and pesto sauce on-hand too so I figured I could use the pizza as a base and doctor it up with a few extra things. This cauliflower crust pizza absolutely blew my mind… it was that great! I really hope this post will inspire you to give it a try. I was a bit nervous and hesitant to try this pizza because last year I attempted to make my own cauliflower crust pizza and it was a bit of a fail on my part. The crust was soft and a tad on the soggy side. It tasted great but the texture was way off. I was afraid this would happen with Caulipower but that’s not the case! The texture of this crust was on-point… no sad, soggy pizza here! For me, the crust of this pizza really did taste and feel like a regular pizza crust, maybe not 100% but for the most part! Let it be known that this pizza would have been completely perfect without the addition of extra toppings. The Caulipower Veggie pizza comes equipped with a medley of bell peppers in green, red, and yellow. It also has the right amount of mozzarella cheese topping it. The sauce really, to me, is what makes a pizza great. The sauce can either make it or break it and Caulipower comes through and delivers a fine sauce made with vine-ripened tomatoes, garlic, extra virgin olive oil, and a blend of Italian seasoning. We added black olives, pepperoni, and pesto to this pizza to take it to the next level. When my daughter took her first bite she said, “Mom, this pizza is sooooooo flavorful! YUM”. I kid you not, that is what Chloe exclaimed. I have nothing to hide here! I will show off this nutrition label for the Caulipower because I love what I see. We did add those extra toppings so it changes it a bit for us, but if you choose to eat as is, half the pizza is only 310 calories! 2 grams of sugar equals awesome! 37 grams of carbs is a great number for half a pizza. You will also get 10 grams of protein if you eat half. Finding a great gluten-free pizza can often be a daunting task but not so with Caulipower. The cauliflower crusts mimics a regular crust. I don’t know how they did it but they succeeded here. Sometimes when I eat a gluten-free substitute I am disappointed and it makes me miss the way that I used to be able to eat. I feel as though Caulipower will be my go-to frozen pizza from now on. I usually don’t care for the outer edge of crust but dang…. I ate the whole entire thing here. The crust is so incredible that it won an award from Eat This, Not That in 2017. Self Magazine also gave it an award for best gluten-free frozen pizza. Chloe and I shared this pizza. The pizza is enough for two people. That might be my one and only complaint here. I wish this pizza was large enough to feed 3-4 people. I am going to gripe about that. When I picked my groceries up, the size of this pizza saddened me a bit because I thought it was going to be more like a Freschetta or DiGiorno size. For the price of this pizza I really was expecting more. Shop Caulipower on Amazon and receive FREE 2-day shipping with Amazon Prime. I have zero regrets for taking the plunge and trying this new pizza out. I just wish you got a little more for your money. They are gaining in popularity nowadays so hopefully the cost will go down a bit because to feed my family of 3, we would have to purchase two pizzas. My husband eats a lot of pizza and there is no way that one pizza can be split with three people unless you were serving it with a side-dish (maybe cauliflower breadsticks?). That is actually a great idea. I would love to see Caulipower come out with some Caulipower garlic bread. That would be the ultimate gluten-free, low-carb meal for me! What I really would like to try out next is the blank grain-free paleo crust. I think it is always fun to create your own pizza and add any toppings you want to it, and as much as you want! For me with pizza toppings, the more the merrier! Have you ever tried a cauliflower pizza before? Did you make it yourself or go with a frozen pizza? What are your thoughts? Leave me a comment and let me know. Want to learn more about Caulipower? This entry was posted in My Cooking Journey, Product Reviews and tagged bell peppers, black olives, cauliflower, cauliflower crust, Caulipower, dinner, frozen food, frozen pizza, gluten free, glutenfree, healthy, healthy dinner, healthy food, low carb, pepperoni, peppers, pesto. Bookmark the permalink. This pizza will definitely be on my to try list! Sounds interesting! You most definitely need to try this. I can assure you that you will love it! Thanks for stopping by and reading my blog.